Knee pain can be a frustrating problem for people of all ages. Whether you’re an athlete trying to stay in the game or just trying to get through your daily routine, pain in the knee can really slow you down. Pain in and around the knee can be caused by a variety of problems, some of which respond very well to injections. So when is it time to get a shot and what should you know about injections? 1. When can knee injections be helpful? Injections are generally recommended to treat inflammation that occurs in the tissues in and around the knee joint. Inflammation is the body’s natural response to injury. It’s a process that brings increased blood flow and heightens defenses around an area that is damaged. When it goes into overdrive, however, it also works hard to let you know that something is happening, and it does so by causing PAIN. In medical jargon, the suffix –itis generally refers to an inflammatory condition. Injections in or around the joint can be used to treat pain related to inflammation of the joint lining, or synovium (synovitis); the tendons (tendonitis); or inflammation associated with the gradual degeneration of the cartilage-bearing surfaces (arthritis). 2. What is typically being injected? The specific medication(s) being injected may vary depending on the condition being treated and your physician’s discretion. There are three main varieties of injections that are typically utilized. Corticosteroids are the most commonly injected medication and are still the gold standard to which all other types of injection are compared. There are various formulations, and you may hear terms like steroid and cortisone used generically to refer to any of the various versions. Corticosteroids are a very potent anti-inflammatory medication. They can be given orally, or intravenously in some circumstances, but have a fairly wide range of effects, some less desirable than others. A local injection can be an effective way to deliver a potent dose of anti-inflammatory medication while at the same time limiting the systemic side effects. It is common to combine corticosteroids with a local anesthetic, which can provide some initial numbing and relief of the affected area since the anti-inflammatory effects may take days to set in. Corticosteroid injections can be effective for treating any of the inflammatory conditions noted above. Viscosupplementation is a more recent development although it has been in common practice for well over a decade now. This is a treatment that is FDA approved only for the treatment of knee arthritis. It involves an injection or a series of injections (typically three to five, depending on the compound) of a viscous material which is, in its essence, a synthetic version of normal joint (synovial) fluid. When a knee begins to develop arthritis, changes have been noted in the synovial fluid such that it has a tendency to become less viscous and pro-inflammatory. Hyaluronan is the molecule in synovial fluid that is largely responsible for the viscosity of the fluid and its breakdown products can induce an inflammatory state. Conversely, replacement of abnormal synovial fluid with synthetic hyaluronan (also called hyaluronic acid) derivatives has been shown to reduce pain and inflammation in the arthritic knee. Synthetic versions can be derived from rooster combs or engineered in a lab, and there are a variety of proprietary formulations available. Viscosupplementation has been shown to be an effective treatment for pain and inflammation in patients with mild to moderate osteoarthritis of the knee. Regenerative Biologic Agents are increasingly being studied with regard to their potential orthopedic applications. A variety of agents, including stem cells and platelet-rich plasma, have been advocated for treatment of musculoskeletal injuries, including degeneration of tendons or cartilage. At present, these agents are still considered experimental and are typically not covered by any insurance. Use has increased considerably in recent years though the definitive role of these agents remains controversial. Rigorously conducted Level 1 studies and cost/benefit analyses for these agents remain lacking at this time, though research is ongoing. 3. How are injections typically done? Knee injections are frequently done as an office procedure, though in some circumstances, they may be done in an operating room, especially if being done in combination with another surgical procedure (such as a knee replacement on the opposite side). In order to reduce the risk of infection, the procedure must be done utilizing sterile technique. Your physician will “prep” the skin with a cleaning agent, typically an alcohol or iodine-based solution and, once prepped, the injection site should only be touched with sterile gloves or a sterile needle until injection is complete. 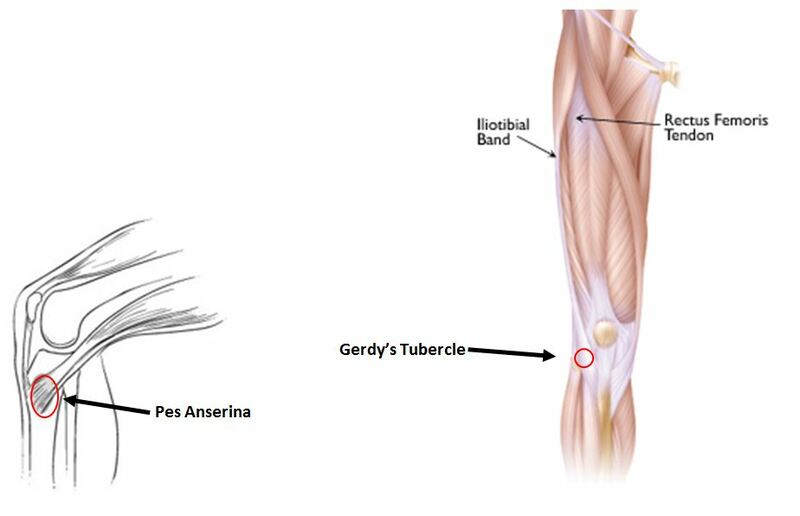 Injections for tendon inflammation may be placed into the various sites of tendon insertion around the knee, such as the pes anserina on the inside of the shin bone or Gerdy’s tubercle on the outside of the knee. 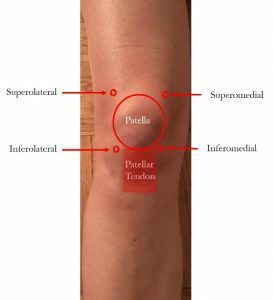 For injections into the knee joint, there are four basic portals of entry: superolateral, superomedial, anterolateral, and anteromedial. The superior portals are at or just slightly above the knee cap on either side and are typically injected with the knee held in extension. The anterior portals are in the front, and just below the knee cap on either side. These portals are typically injected with the knee in flexion. Injection site may vary based on your knee’s range of motion, ability to fully extend, the presence of fluid collection in the knee, and physician discretion. In general, all roads lead to Rome and any of these portals can be used to get the medication into the knee joint where it mixes with the synovial fluid and circulates around the knee (thus you don’t necessarily have to have an injection on the inside of the knee just because your pain is mostly on the inside). 4. What are the common risks of injections? Pseudo-sepsis, a rare allergic type reaction to viscosupplementation that can result in significant pain and swelling which can, at times, mimic infection. 5. What should you expect after injection? After an injection, a small Band-Aid is placed on the site and patients are typically able to go about their daily activities. Injections that include a local anesthetic may have a near-immediate effect while other agents may take several days to have an effect. As mentioned above, there is some incidence of a phenomenon referred to as a “post-injection flare” wherein the injection of fluid into the knee stretches the knee capsule and induces an initial inflammatory pain response that can last for a day or so. This is uncommon but, if it occurs, may respond to rest, ice, compression, elevation, and over-the-counter anti-inflammatory medications such as ibuprofen or naproxen. Prolonged pain or severe pain, especially associated with decreased range of motion or redness, could be sign of infection and should be discussed with your physician immediately. For more information about knee injections and treatment for knee injuries and pain, email us or request an appointment. 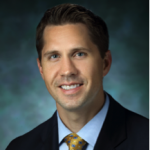 Dr. Benjamin McArthur is a fellowship-trained orthopedic surgeon at Washington Orthopaedics & Sports Medicine. His specializations include hip and knee replacement, complex revision hip and knee replacement, and hip preservation surgery. He has published numerous peer-reviewed articles and has presented at national and international events on topics related to hip and knee replacement. He is a reviewer of current research for the Bone and Joint Journal, The Journal of Arthroplasty, and the American Journal of Orthopedics.